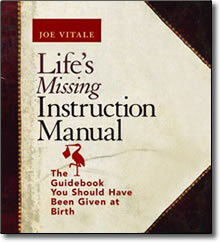 The Guidebook You Should Have Been Given at Birth! Bestselling author and marketing guru Joe Vitale offers insights and life lessons for achieving success. In the simple, straightforward tone of an instructional manual, this audio book offers big wisdom and little-known secrets for living a better life. Packed with life lessons most listeners will wish they’d learned earlier, Life’s Missing Instruction Manual uses humor and anecdote to present practical steps listeners can use to take control of their lives, overcome any obstacle, and find fulfillment. Each simple lesson is explained and brought into focus with real-life examples and includes practical steps on putting those lessons to work every day. Full of uncommon wisdom and lighthearted humor, this book will help the listener develop confidence, create a plan for success, get ahead at work, build rapport with others, develop time-management skills, and find wealth and happiness.